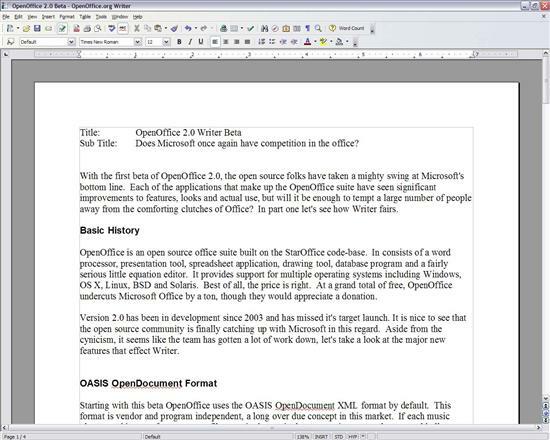 OpenOffice is an open source office suite built on the StarOffice code-base. It consists of a word processor, presentation tool, spreadsheet application, drawing tool, database program and a fairly serious little equation editor. It provides support for multiple operating systems including Windows, OS X, Linux, BSD and Solaris. Best of all, the price is right. 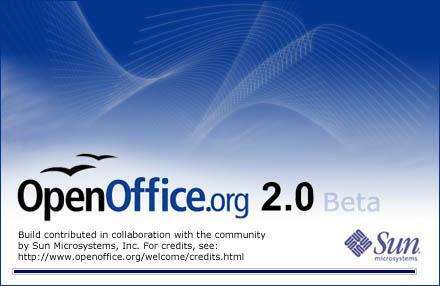 At a grand total of free, OpenOffice undercuts Microsoft Office by a lot, although they would appreciate a donation. Version 2.0 has been in development since 2003 and has missed it's target launch. It is nice to see that the open source community is finally catching up with Microsoft in this regard. Aside from the cynicism, it seems like the team has gotten a lot of work done, let's take a look at the major new features that affect Writer. Writer, if you haven't gathered, is the OpenOffice equivalent of Word. Ah, now here is progress. Writer and the rest of the OpenOffice suite have come a long way in the looks department. OpenOffice 2.0 greatly improves the look and customizability over previous versions. Instead of the decidedly old, clunky look of the 1.X version, 2.0 on Windows looks like a clean, modern application. As you can see from the screenshots, Writer now looks a lot like Word. This makes the transition from Word a great deal easier, but what about the little differences? You can fix most of those yourself. The toolbars in Writer are customizable to the point that you can put any feature or tool on any toolbar you like. You can then position the toolbars wherever you like.